Portable & organized out of the home first aid. Over 40 items! Organized Case - Keeps items accessible & in place. Clean:6-Johnson & Johnson Cleansing Wipes. Treat:4- Band-Aid brand First Aid Antibiotic Ointment Net wt. .03 oz. (.89g. Protect:15-Band-Aid Brand Adhesive Bandages 5/8 x 2 1/4” (1.5 cm x 5.7cm). 8- Band-Aid Brand Spots Adhesive Bandages 7/8"x7/8” (2.2cmx2.2cm). 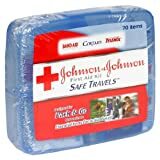 8- Johnson & Johnson Gauze Pads (4 2-packs) 2” x 2” (5.1cm x 5.1cm). 6- Band-Aid Brand Butterfly Closures 1” x 3/8” (2.5cm x 1cm) 5-Band-Aid Brand Adhesive Bandages 1” x 3” (2.5cm x 7.6cm). Other First Aid & Utility Items:4-Tylenol Acetaminophen Extra Strength Caplets. 2- Motrin IB Caplets 1- Cortaid Advanced 12-hour Anti-itch cream Net. wt. 0.1oz (2.8g).1-Organized Carrying Case. (Caution: The packaging of this product contains natural rubber latex which may cause allergic reactions). 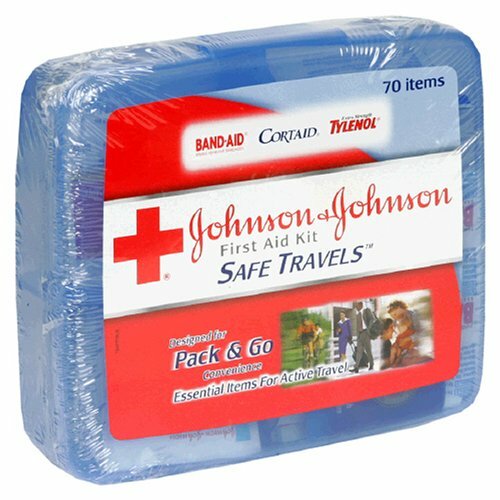 Other First Aid & Utility Items: 4 - Tylenol Acetaminophen Extra Strength Tablets; 4 - Motrin IB Caplets; 2 - St. Joseph Adult Aspirin Therapy; 1 - Organized Carrying Case.